You wait ages for a Hanne Darboven exhibition to arrive and then two come at once. Well, kind of. This severest of German conceptual artists (Darboven died in 2009) has her first British solo show at Camden Arts Centre and – strangely unrelated in time – March’s AV Festival is staging the British premier of Darboven’s Requiem (2009), an organ work based on the transcription of dates from the start to finish of the 20th century, and with some quotations from Ligeti, Brahms and Bach to sweeten the path. Where to start with Darboven’s work? 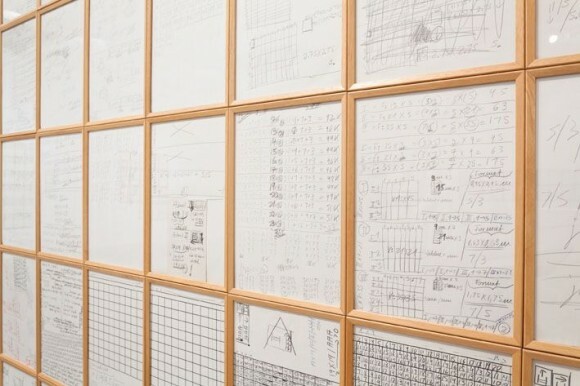 Series of framed sheets of writing paper covered with grids of numbers, cursive handwritings – a kind of not-writing – fill its walls. The sepulchral tones and repetitive figures of the artist’s work for organ, 24 Gesänge, Opus 15, 15, A, B (1984), seep in from an adjacent gallery. In all things, there is a sense of the unfinished (where, after all, do the sequences end? ), which is another way of highlighting the infinite. The relentlessness of her serial systemisation – and the presentation of her systemisation – is virtually unbroken except for a drawing table placed at the centre of a gallery. Darboven used the table for her two years in New York in the mid-60s; on it lies a sheet of paper where she had scribbled phone numbers, tried out pencils and noted the death dates of her pet goats (all, seemingly, named Mickey) to whom she sometimes co-credited her work. It’s not an understatement to say that the first impression of Darboven’s work is overwhelming. But then it is meant to be and Camden’s excellent show doesn’t baulk at the difficulty here. Darboven, a conceptualist in the way that On Kawara or Sol Le Witt were conceptualists, produced work in which a manifest laboriousness was important. It is work – like music – that exists in time, and all the more brave for it. Yet the link between sight and sound in Darboven’s work has often been minimised. Not here. There is a pleasing focus on Darboven’s music: 24 Gesänge is accompanied by its visual component – multiples of framed sheets, postcards and vintage greetings cards, many commemorating first communions. Listening stations play her Requiem and – from Wende 80 – Stille Nacht, Heilige Nacht (1980/81) – each work 11 CDS in length. Often, Darboven helps us make links ourselves. Another massive work – Vier Jahreszeiten (1981/82) – appears in the form of a silent film on a large monitor: rows and rows of numbers scroll across the screen. The patterns they make are incidental, but the reference to Vivaldi is apparent in the title. It would be mistake to think of Darboven’s work as reductive in any way: if anything, it is extraordinary expansive. She sees, in the codes of everyday life, a way of harmonising art and work – and making an infinite point about our very finite existences.